How in the previous sentence could you warn us with such certainty of a teaching in which you are still not certain and of which you must admit at least that it might not "have been just insinuated" (as your previously declared,) but that many righteous teachers of the church had taught it was this way and no other for a long time, as we have reported it to you. What is related in the passages of 2 Timothy 2, 2 and Titus 1, 5 we refer to as the cornerstone of our representation of the teaching on ordination and we await proof from you that in each passage one does not merely find a special command of the apostles to Timothy but rather a universal command to the entirety of Christendom. If each word of St. Paul contained a "conditio sine qua non," then a Christian stranded on an island might preach the word of God to the heathen populace and baptise them but afterwards when one of these people was called to the pastorate he could not be accepted to the office since he could not receive church ordination. To 5. Here violence has been done to our words. Where have we denied that as a rule the here mentioned testing may have come from the original preaching office? However concerning emergencies (please mark well), concerning emergencies we have discussed where such testing is impossible either because of the absence of a preacher or in the time of ecclesiastic devastation, as for example, before the Reformation when the authorities were guilty of neglect and slipped in some untested preachers, who were then acknowledged by the church provided they were properly called and already invested. We only wanted to present this sting of logic, which occurred to many harried congregations if their preachers should not have been recognized because perhaps they could not be tested in optima forma by the ministry. However we have never said a word about rampant scorners of the spiritual office, true mutineers and courtly separatists, enemies of church order, fanatics and the ignorant; whoever wants to understand anything about our words must recognize that people such as these are not found within its reckoning. To 6 and 7. On both these points, with regard to Pastors Geyer and Klügel, they should be fully dealt with as soon as the differences in doctrine between you and us are settled, the 17 errors you stated are refuted and the counterproofs of your errors and injustices are acknowledged and abolished or sufficiently refuted. Without this settlement everything would be, as we were forced to say, talking into the wind and expending useless effort; our precious time and forces of body and spirit are better spend elsewhere. To 8. What is said here concerning Luther's letter to the Bohemians, is that indeed not proof, which should persuade us with its authoritative evidence? — No, you have not demonstrated a single one of your cited passages to us; you've only negated and emphasized everything by necessity. Do you consider us small children, who had to be quieted with authoritative commands? — For our part we are ashamed and truly, if we had pushed our subjective opinions upon you and had not demonstrated more respect for your office, which you would have ever more highly valued while we would have it sufficiently devalued. To 9. To our righteous astonishment you will have the last word on the once more seized upon matter of our brother in office, Fürbringer! We have no desire to justify and dispute this with you any further. We had to always take you to task for your false teaching concerning ordination and at the same time your lovelessness, which does not know how to have mercy on feeble and afflicted souls. To 12. The "great hostility," which you charge us with here, we must ascribe to you alone and we are at peace through God's grace in our conscience, that we are not guilty of creating the schism between us and you, but rather have attempted with all our power to prevent this. However since you do not acknowledge your own guilt or at least do not recognize it but rather fortify it and other sins and then intensify your perversity through communal synodal decrees, so we must all the more pull back in fear of the greatness of your guilt and the danger to your souls, wherein you close your hearts ever tighter to the testimony of truth and in unholy delusion of singular non-betrayal would disown everyone as scorners of evangelical Lutheranism as your pastoral letter and your own arbitrary declarations construe so unconditionally. You really do not believe that under such circumstances anyone could accept an invitation to your synod, if one were offered to us. — If you had not held so stubbornly to your pastoral letter as a symbol and if you had yielded on a few points, wherein you were sufficiently convinced by the testimony of the holy scriptures and the righteous faith church, and if you were willing to let rest certain other points for the sake of peace, or if you had been willing to pray for a broader understanding of the matter, then the freedom of conscience on both sides would have remained unsullied and mutual understanding and unity could exist between us as it had often existed in previous cases of church teaching; certainly God would have helped, lending ever more light and support so that unity in the spirit would be achieved between us and in accordance with the close of the preface to the Book of Concord "current or new disputes between us would have been weighed and reconciled without dangerously compounding and hostility would have been prevented." However since you broadcast our beliefs before men and seem to consider it a shame and will not yield even one inch, the rift between you and us must grow increasingly hostile because of you. In this letter I wrote with necessary decisiveness but also with pain and sighing to God and this is also the attitude and pronouncement of my beloved brothers in office, who with me are recipients of the grace of God in a united and sanctifying faith and are bound in mutual heartfelt love and harmony. May He also give us and all, who would have His truth, His Holy Spirit that we remain true to the pure teaching of His divine word and give His truly beloved church on earth victory over others in these battles of our late and troubled times so that man might see the righteous God of Zion. Amen. also in the names of his above-named brothers in office. As of August 2, 1845 when our letter was sent out, we had neither seen nor heard anything of the synodal letter which our opponent allowed to be published on the 25th of June of the same year at the Synod held in Milwaukee. When later we were sent it by foreign hands we found in passages regarding us basically the same things without all evidence of contradictory and dogmatic spirit, such as the synodal letter we had directly received in Section 6. But to our great astonishment we also had to recognize how they were unashamed in making public the entire matter in dispute in such a highly distorted and biased fashion that the judgment of uninformed readers must necessarily be corrupted and slanted against us. with his brothers in office and come together in conference with us, whereupon he also hoped for God's help in order that the prevailing differences between us and him might be resolved. Once again we submitted a provisional response, which we thought to submit in our Lutheran lest we be publically assaulted as we had been in the Milwaukee synodal letter. Since a congregation in Wisconsin, which took part in the Milwaukee Synod and later became disquieted in its conscience over it, took exception to our silence and could not understand why we would not have attended a synod to which, as people incorrectly said, we had been invited, we felt compelled to publish the "provisional response" in No. 8 in the 3rd volume of our Lutheran and we beckon the inclined reader to scrutinize the details for himself. Above all else we had to declare in this sentence: "In the course of a year nothing has been done on the part of our opponents in Buffalo and Wisconsin in order to come to an understanding of the foundation of a proper profession of truth or to rescind all publically expressed unjust charges against us, thus we feel bound in our conscience, to the honor of God and His word, as much as to the defense of our office, to allow the entire dispute between us and their faction, brought on by the Grabau pastoral letter, to press on so that a Christian unbiased reader might judge for himself whether or not we could have conceded the named points." Even so, we spoke once more of our hope and our heart's desire despite the threats with these words: Should the conference desired by Pastor Grabau occur early next year with God's help, then further details will be published, concerning what we have to do and what we have to allow and once again we declare that we have no desire to quarrel but seek peace wholeheartedly; we will not dispose of recognized truth but will prove and defend it with all our power, so God help us! 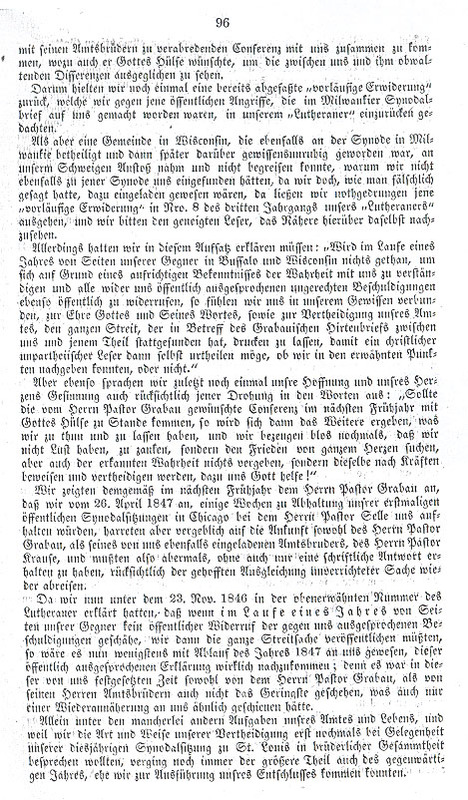 Early the next year we notified Pastor Grabau that in April 26, 1847 we would be holding our first public synodal session, which would last one week and would be held at the parish of Pastor Selle for one week. We waited in vain for the arrival of Pastor Grabau and his brother in office, Krause, whom we also had invited; and so without even having received a written reply, the hoped-for settling of unresolved matters again sailed away. 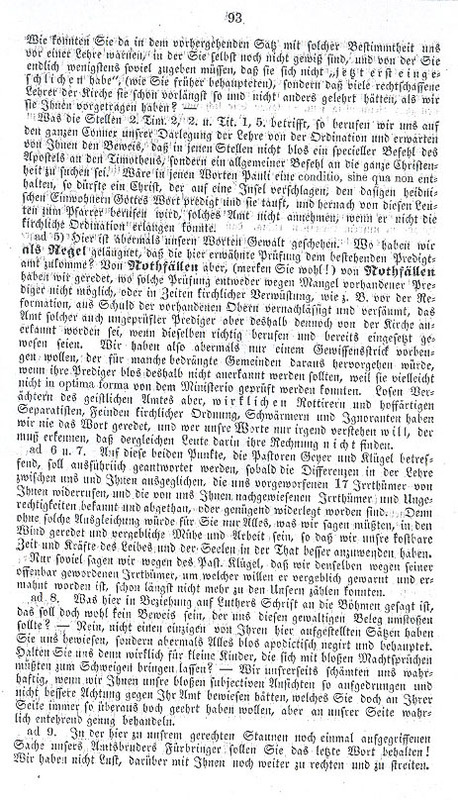 In the November 23, 1846 edition of Volume 3 of the Lutheran we had stated that if in the course of a year there was no revocation of the expressed charges made against us by our opponents, we would have to make public all the issues in the dispute; and thus with the end of 1847 it would be up to us to follow through on this public declaration. not the slightest action was taken during that established timeframe by Pastor Grabau or his brothers in office which might be seen as a renewed attempt to approach us. With the many other demands of our office and life, and because we wanted to discuss the ways and means of our defense on the occasion of our yearly session of the synod in St. Louis in fraternal communion, a greater portion of the year passed before we could come to an execution of our resolution. Let each Christian reader see in this how the ensuing public exhibition of the entire matter was finally and truly not undertaken out of combativeness or hasty, thoughtless ardor. We have gone about this earnestly and slowly enough in laying the matter before the entire church, which most definitely will bring us into open conflict concerning more than a few differences in doctrine with all the pastors and congregations in Buffalo and Wisconsin than we might have wished for; we put this off as long as possible lest we might have been able to bring about a peaceful solution to the current state of affairs. This still remains our hope and our goal and it is our prayer to God and yet we can no longer keep quiet lest we would have the appearance of renunciation of the truth visited upon us and our publically-given word left unfulfilled; our hope, our goal and our prayer have been repeated and earnestly remembered by many factions. In referring back once more to what we stated in the preface, it still remains for us to answer the above listed distorted and biased pronouncement concerning the entire dispute, which our opponents made public in their Milwaukee synodal letter. The unbiased reader, who puts forth some effort to compare this combative pronouncement with the current letter discussing certain deliberations and documents, will without a doubt be able to judge for himself whether or not the Milwaukee synodal letter reported the truth. 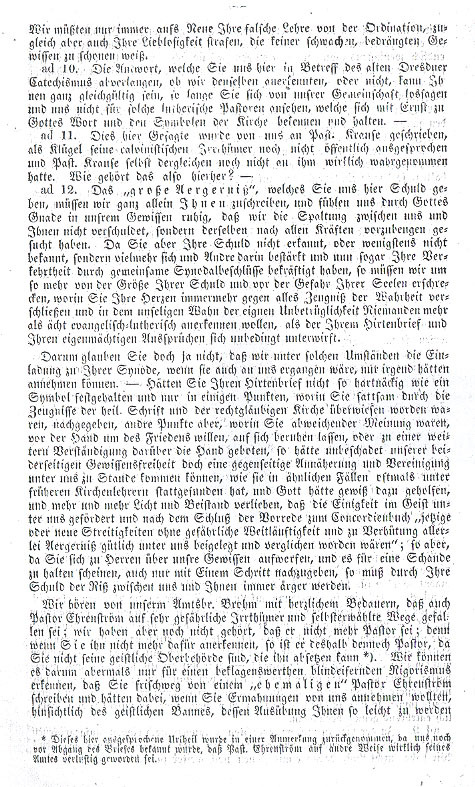 Here we will impart some relevant passages from the report word for word, and it is indeed necessary to at least call attention to one or other passages with brief comments and to justify our verdict, which we have expressed in the relevant portions of the report, with a few words at the end for the uninformed reader. 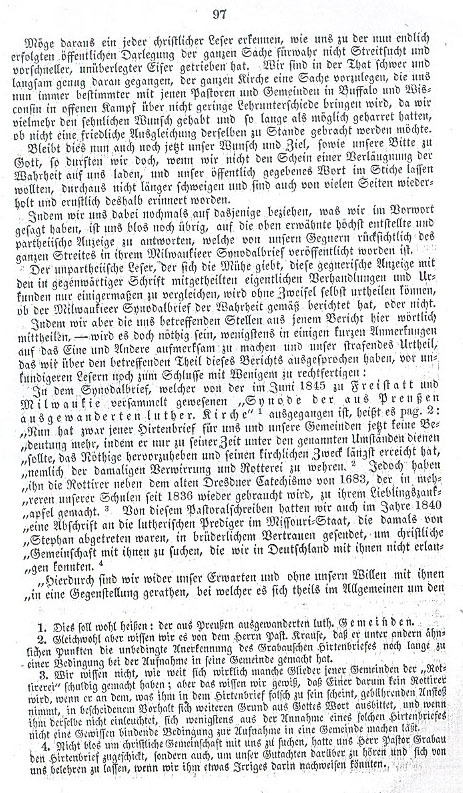 In the synodal letter, which was issued in June 1845 by the "Synod of the Immigrant Lutheran Church from Prussia" (1) assembled in Freistatt and Milwaukee, it states on page 2: "The pastoral letter has no other meaning for us and our congregations but that it served in its time under the described circumstances to make evident the most necessary things and in the end the church accomplished its goals in keeping the confusion and the mutiny in check (2). Next to the old Dresden Catechism of 1683, which has again been much in use in our schools since 1836, the mutineers have made the pastoral letter their favorite bone of contention (3). 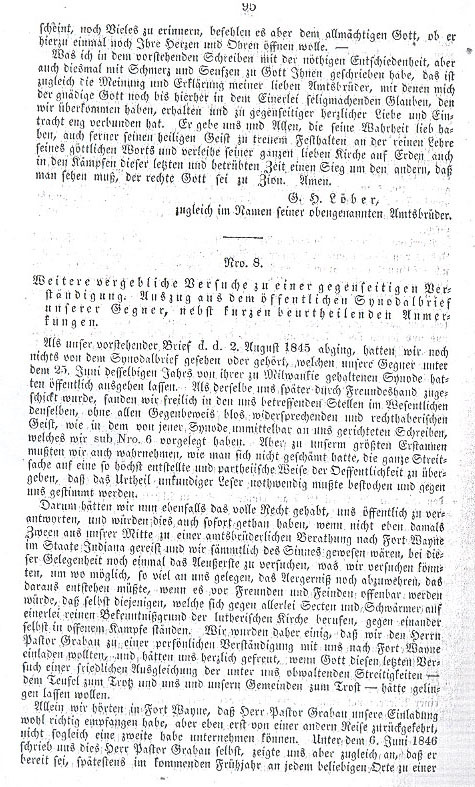 In the year 1840, in brotherly trust we sent a copy of this pastoral letter to the Lutheran pastors in the State of Missouri, who by that time had separated from Stephan; we sought the Christian communion with them which we could not be achieved in Germany (4).